The 2019 National Hardware Show® (NHS) is May 7-9, 2019 in Las Vegas, NV. Come explore numerous product categories on display by over 2,500 exhibitors. This year’s show will feature a variety of new sections and categories, additional interactive experiences, enhanced programs, and more. Legacy will showcase new innovative products that expand our brands in the Hardware & Tools, Lawn, Garden & Outdoor Living, Farm & Ranch, Automotive and Industrial categories. Visit Legacy at Booths #12246 and #6442! Legacy™ Manufacturing Company will attend the SEMA Show October 30-November 2, 2018, in Las Vegas, NV. Legacy, the maker of Flexzilla®, will gather with over 70,000+ domestic and international buyers to learn about the future of the automotive industry. 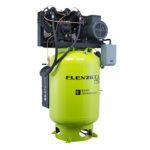 Legacy will showcase their Flexzilla brand including their new Air Compressors with Quiet Technology, in addition to air hoses, air tools, blow guns and modular accessories, work & garden gloves, and more. Visit us at booth #15223! Let’s face it, standard air compressors are LOUD. All this NOISE interferes with workplace communication, lowers productivity on the job, and increases risk of hearing loss. Fortunately, Flexzilla™ brings quiet back to the workplace. Legacy™ Manufacturing Company will attend the AAPEX Show October 30-November 1, 2018, in Las Vegas, NV. Legacy, the maker of Flexzilla®, will gather with over 44,000+ targeted buyers and more than 130,000 professionals to learn about the future of the automotive industry. Legacy will showcase their brands: Flexzilla air hoses, air tools, air compressors, water hoses, power cords, grease guns and hoses, blow guns and modular accessories, and work & garden gloves; SmartFlex™ air, garden, and RV/Marine hoses; Lock-n-Load™ grease guns and accessories; and ColorConnex® couplers and plugs. Visit us at booth #838! The exclusive modular accessories system (sold separately) allows the Flexzilla™ blow guns to be customized for extension length and tips needed for any job. Bendable extension that holds position. Flexible hybrid polymer cover. O-ring seal on threads. Lock-n-Load™ technology is Legacy’s first-in-the-industry system for fast grease reloading. The Lock-n-Load threadless, quick connect barrel lets you reload grease in half the time compared to other grease guns. Just slide the Lock-n-Load switch to disengage or reconnect the barrel. Never worry about crossing threads on your barrel again, and get fast priming every time. Add more power to your spraying jobs. Attaching the hose inline with the spray nozzle gives Flexzilla® Pro Water Nozzles up to 30% more water flow, pressure and power. These heavy-duty nozzles are built to last in the toughest work environments. Marion, IA – Legacy® Manufacturing Company, the maker of Flexzilla® extreme performance water and air hoses, will be expanding its recently completed facility as a result of continued growth and success in reshoring some manufacturing back to the US. In 2016, Legacy completed it’s 133,000 square foot facility located at 6509 Partners Avenue in Marion, Iowa. The new warehouse expansion will add 200,000 square feet to Legacy’s existing facility with a capital investment of $11 million. This expansion adds support for Legacy’s reshoring efforts of its many proprietary products including the Flexzilla® brand of air hose. 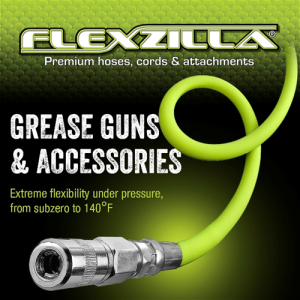 Other Flexzilla® branded products like the new Flexzilla water hoses with patent pending SwivelGrip™ technology have attained great market acceptance in the vast lawn and garden and outdoor power categories, leading to robust growth for the company. Construction will begin immediately. The expansion is expected to create 13 new jobs over the next three years. Legacy currently has 58 employees in Marion. The Marion Economic Development Corporation (MEDCO) partnered with the Cedar Rapids Metro Economic Alliance in preparing an application to the State of Iowa’s High Quality Jobs Program. The City of Marion coupled with the Iowa Economic Development Authority approved incentives last week totaling $1,100,000. This important Local and State support was vital to making this expansion possible. Legacy, an international company, is a division of Weems Industries. Legacy has been serving various markets since 1986, offering a wide-range of professional grade service and maintenance equipment for automotive, industrial, contractor, agricultural and marine markets throughout North America. Legacy™ Manufacturing Company will attend the AAPEX Show October 31-November 2, 2017, in Las Vegas, NV. Legacy, the maker of Flexzilla®, will gather with over 44,000+ targeted buyers and more than 130,000 professionals to learn about the future of the automotive industry. Legacy will showcase their brands: Flexzilla air hoses and air tools, water hoses, power cords, grease guns and hoses, blow guns and modular accessories, and work & garden gloves; SmartFlex™ air, garden, and RV/Marine hoses; Lock-n-Load™ grease guns and accessories; and ColorConnex® couplers and plugs. Visit us at booth #1671! 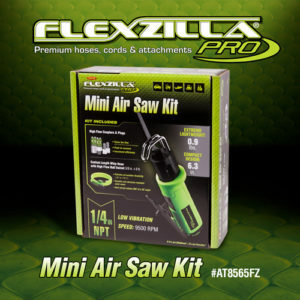 The Flexzilla® Pro Reciprocating Air Saw Kit is perfecting for working in tight spaces to get the job done. The lightweight, compact design and low vibration reduces operator fatigue during extended use. plus, its high-speed, strokes per minute, allows you to cut through the toughest materials with ease and comfort. 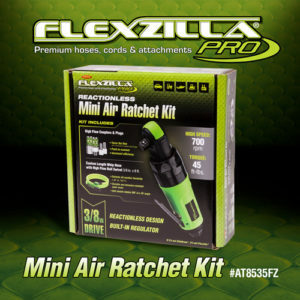 Get in tight spots and get the job done with Flexzilla® Pro Reactionless Mini Air Ratchet Kit. No more busted knuckles or pinched fingers. The reactionless clutch prevents kickback when you bottom out. The compact and lightweight design is perfect for small workspaces like under dashboards. 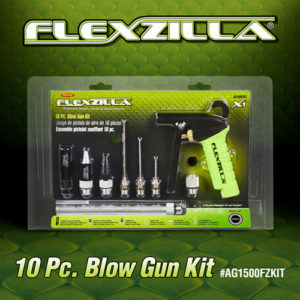 Introducing, the Flexzilla™ Blow Guns with modular accessories. Flexzilla features an ergonomically superior gun body for maximum comfort and control which reduces operator fatigue. Unique to the Flexzilla blow guns and modular accessories system allows you to customize the gun extension length and tips for every application. Flexzilla Safety Nozzles meet or exceed OSHA standards for pressure relief. And the Quiet-Flo Safety Nozzle goes one step further to also meet noise standards. There is a new creature dominating automotive shops, farms, and worksites across the country. 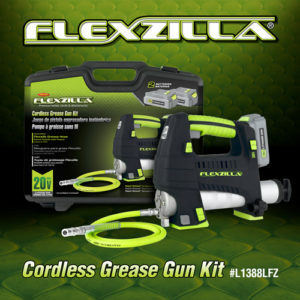 Introducing the Flexzilla™ 20V Cordless Grease Gun Kit. It proves what can be accomplished when you combine over 30 years of grease gun experience from Legacy Manufacturing with the extreme performance of Flexzilla. MARION, Iowa — Legacy™ Manufacturing Company is bringing together more than 30 years of grease gun experience and their easily recognizable ZillaGreen™ hose to introduce the Flexzilla® 20 Volt Cordless Grease Gun Kit. Non-slip pads on the base and sides of the tool allow secure operation at any orientation. 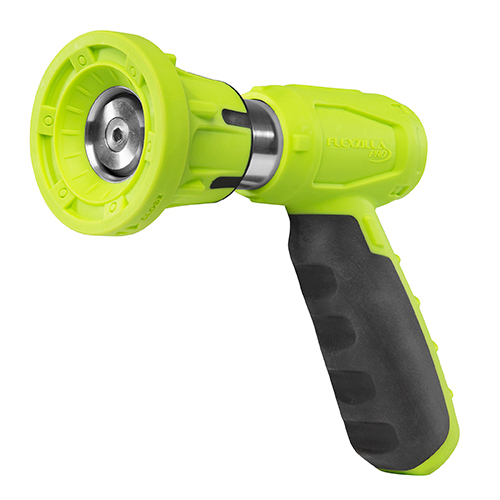 Plus, the Flexzilla Cordless Grease Gun has a hose dock built into both sides so it can be operated with either hand. A built-in LED work light illuminates grease zerks in dark areas. The kit includes two heavy-duty 20 Volt MAX lithium-ion batteries and a 1-hour quick charger. A unique battery-park feature prevents accidental discharge of grease in transit and saves battery life. Flexzilla products are made and distributed by Legacy Manufacturing Company, an international business located in Marion, Iowa that specializes in durable and innovative products for automotive, industrial and home markets. Their products include Flexzilla air and water hoses, extension cords, work and garden gloves, air tools and lube equipment, SmartFlex™ air and garden hoses, Lock-n-Load™ grease guns and ColorConnex®, an easy color matching system of couplers and plugs. Legacy Manufacturing is a division of Weems Industries, founded in 1990. For more information, visit legacymfg.com or flexzilla.com. MARION, Iowa — New professional air tools in the distinctive ZillaGreen™ color will soon be available through automotive wholesale suppliers. Legacy™ Manufacturing Company, known for their line of Flexzilla® Air and Water Hoses, is introducing the Flexzilla Pro Mini Impact Wrench with a half-inch drive. It will be available as a stand-alone tool and as part of a complete kit. The Flexzilla Pro Mini Impact Wrench is rated at 550 ft-lbs. of working torque and 800 ft-lbs. of nut-busting torque. It features an ergonomic grip with a patented forward/reverse toggle switch and torque selector that provides easy one-hand operation. A variable speed trigger and three torque settings give mechanics precise control for different applications. 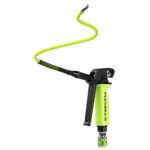 The handle exhaust directs air away from the user and the built-in swivel allows the hose to rotate freely. The professional kit includes a 50-foot Flexzilla Pro Air Hose with field-repairable ends, along with Flexzilla Pro High Flow Fittings and Ball Swivel that deliver twice the airflow as compared to standard interchanges. MARION, Iowa — The Flexzilla SwivelGrip Garden Hose was recently named one of the top products in Ezvid Wiki’s list of the ten best garden hoses for 2017. The full review can be viewed at wiki.ezvid.com/best-garden-hoses. Flexzilla hose is made with the original Premium Hybrid Polymer that doesn’t kink and stays flexible in all weather conditions. The patent pending SwivelGrip fittings make it easier to connect the hose to spigots or attachments. The swivel action works on both ends, so sprinklers lie flat and moving the hose is more efficient. This all-purpose hose is ideal for a wide variety of applications and is drinking water safe. Founded in 2011, Ezvid Wiki claims to have traffic among the top 3,000 websites in the United States. Its YouTube channel has over 175,000 subscribers, providing information that individuals have used to make purchase decisions for more than $85 million worth of products and services. Hint: look toward the bottom of the page or the end of the video for the best reviewed hoses. The 2017 National Hardware Show is May 9-11, 2017 in Las Vegas, NV. Come explore 15 major product categories on display by thousands of exhibitors. Legacy will showcase new innovative products that expand our brands in the Hardware & Tools, Lawn, Garden & Outdoor Living, Farm & Ranch, Automotive and Industrial categories. Visit Legacy at Booths #12246 and #6442! Legacy™ will attend the AAPEX Show November 1-3, 2016, in Las Vegas, NV. Legacy, the maker of Flexzilla®, will gather with over 44,000+ targeted buyers and more than 130,000 professionals to learn about the future of the automotive industry. Legacy will showcase their brands: Flexzilla air hoses, water hoses, and power cords; SmartFlex™ air, garden, and RV/Marine hoses; Lock-n-Load™ grease guns and accessories; Cyclone®, blow guns and ColorConnex®, couplers and plugs. Visit us at booth #2867! 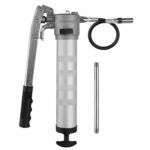 Flexzilla® Heavy Duty Grease Gun with 18” Grease Whip Hose – The Flexzilla Grease Hose provides extreme flexibility under pressure, from subzero to 140°F. Designed with a soft barrel grip to provide better ergonomic control and comfort. Click here to learn more! 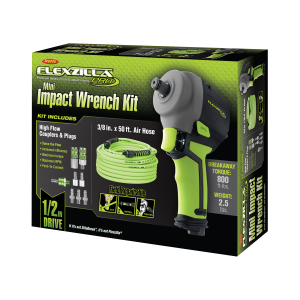 Flexzilla® Pro Mini Impact Wrench Kit includes: Flexzilla Mini Impact Wrench, High Flow Couplers and Plugs, 3/8”x50’ Air Hose that is field repairable. The mini impact wrench has 800 ft-lbs. of nut-busting breakaway torque and an extremely lightweight design. Click here to learn more! 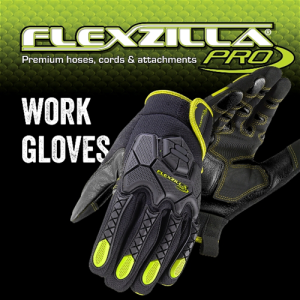 Flexzilla® Pro Heavy Duty Leather Hi Dexterity Work Gloves – Heavy duty grain leather palm for heavy duty wear performance, TPR back patching for impact protection, stretch fit spandex back for comfort & flexibility and TOUCH SCREEN GLOVE TECHNOLOGY. Click here to learn more!